Exciting hands on way to engage students in electrical circuits and Bredboard basics. Perform 50 Experiments with the included teacher guide. Each activity shows a step by step guide with illustrations to engage your students. 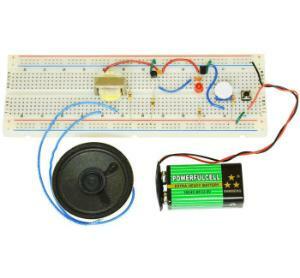 Build an Electronic Keyboard, Electronic Kazoo, Battery Tester, Finger Touch Lamp, Burglar and Water Alarms, a Siren, a Magnetic Bridge, and a whole lot more! No soldering or tools required other than a 9 V battery.